Concerts, a silent Burmese film, and events hosted by the Goethe-Institut and British Embassy keep you busy this week. 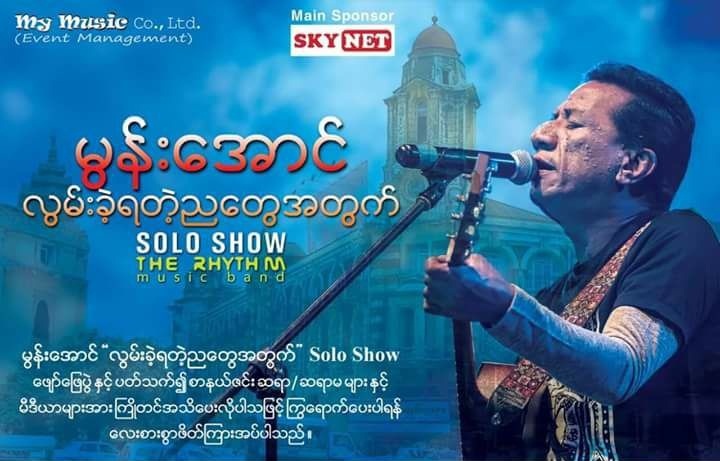 The Kachin ethnic singer and activist will perform songs that he wrote while in exile in Norway in remembrance of his hometown of Myitkyina in Kachin State. Feb. 5, 7pm. National Theater, Myoma Kyaung Street. Tickets priced between 7,000 kyats and 20,000 kyats, available at call center 1876. 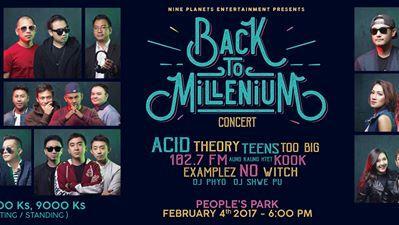 Burma’s first generation of rap, hip-hop and pop artists perform—featuring Acid, Theory, Too Big, Examplez, No and others. Feb. 4, 6pm. People’s Park. Tickets between 9,000 kyats and 50,000 kyats, availalbe at Man Thiri Studio (01-252903), Myanmar Plaza (09-450038049), Junction Square (09-251025241), Junction Mawtin (09-254255571), GMP Mall (09-777251440), and Bogyoke Market. (09-450046351). This education fair held by the Goethe-Institut hosts German universities, foundations, organizations, and the German Embassy and features alumni round table discussions, scholarship counseling, talks on education, information on the EU Erasmus+ program and introductory German lessons. Feb. 4, 9am to 5pm. Goethe Institut, Rose Garden Hotel, No. 171 Upper Pansodan Road, Mingalar Taung Nyunt Tsp. The British Embassy in Rangoon will throw open the gates of the Ambassador’s Garden to welcome everyone for an afternoon of British fun. 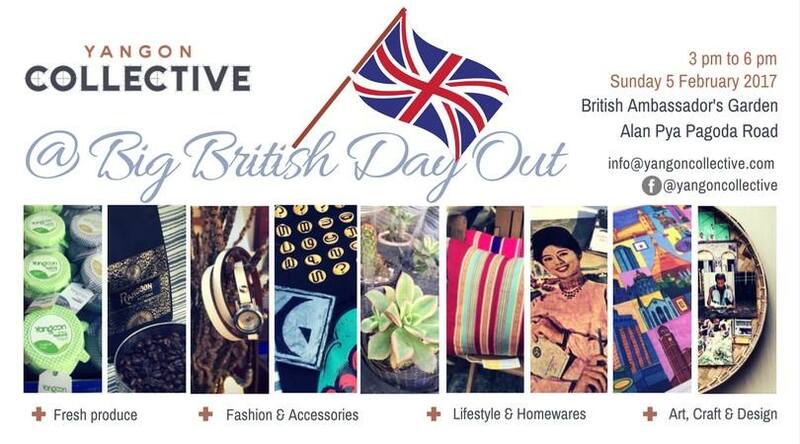 The Big British Day Out will include traditional food, fairground rides, market stalls and more. Feb. 5, 3pm to 6pm. British Ambassador’s Residence, 62 Alan Pya Pagoda Road. Free Admission. Mya Ga Naing (Emerald Jungle) premiered in 1934 and was part of Burma’s golden era of cinema. The silent film will feature live musical accompaniment performed by an ensemble of Burmese and German musicians. Feb., 7pm to 10pm. Institut Francais de Birmanie, No. 340, Pyay Road. Come and enjoy the unique combination of Burma’s traditional Hsaing Waing and western jazz on the lawn of the French Institute. Feb. 3, 7pm to 9pm. Institut Francais de Birmanie, No, 340, Pyay Road. 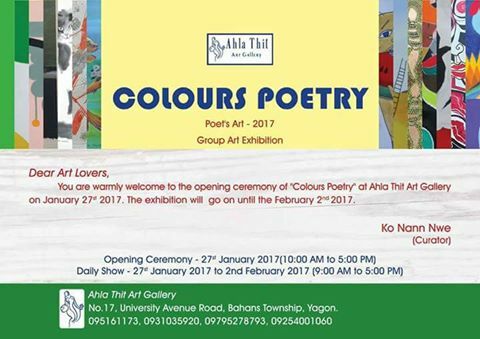 The exhibition will feature 35 works of art by 13 poets along with their handwritten poems and profiles. 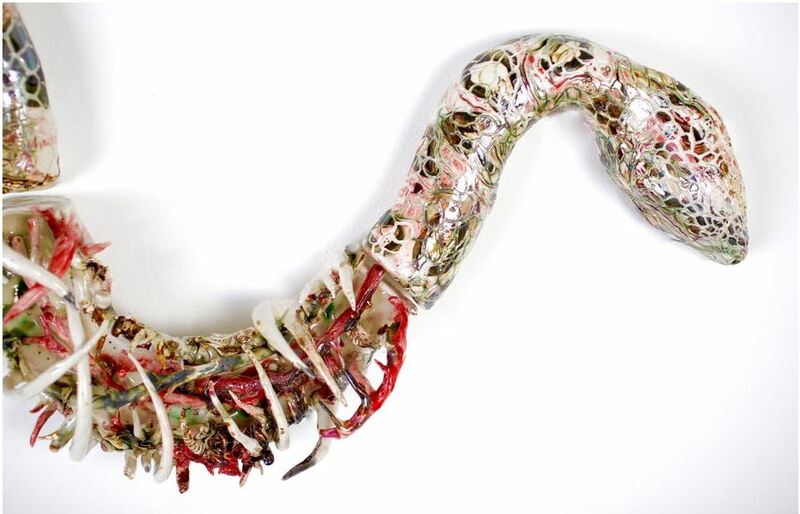 Two works by Taryar Min Wai, the late modern writer and poet, will be up for auction. 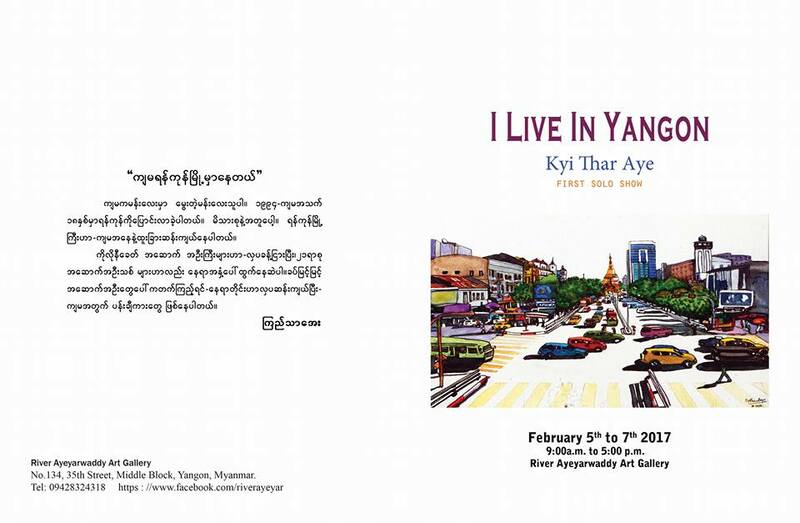 Mandalay-born artist Kyi Thar Aye’s view of the former capital is depicted in some 60 watercolor and acrylic cityscape paintings. Feb.5-7. River Ayeyarwaddy Gallery, 35th Street, Kyauktada Tsp. The concept of spirit houses—animistic shrines that people in Southeast Asia build to placate the spirits disrupted by the human habitat by offering them shelter, food, and entertainment—influences Soe Yu Nwe’s work. Feb.4-16. Myanm/art. No. 98, Third Floor, Bogalay Zay Street. 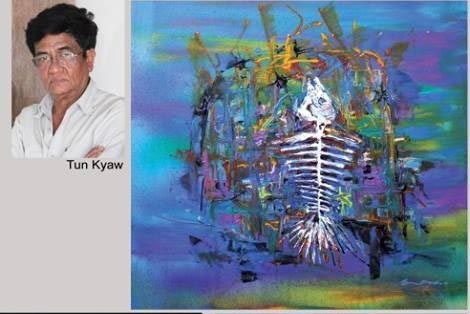 Artist Tun Kyaw’s solo show features more than 86 acrylics, oil paintings and watercolors.